Well my uncles and grandfather told me this story when I was about 12 years old. It’s in Puerto Rico, Las Piedras. Somewhere in a curve. The story is about this “ghostly bride” that was killed by a drunk driver in her wedding day. It is said that after her death, that same day, her husband left her for another woman. So now she scares people that drive by that dark curve. “It was a normal day, I just got out of work when your older stepbrother, Charlie, called me to see if we can go out and eat pizza. Before I left work, one of my friends at work told me about a dead bride that jumps into your car when you are turning on the curve. I didn’t believe it so I decide it to check it out for myself. I use to drive this big, white truck. Right when I’m getting to drive through the curve, it seemed so peaceful and normal. Suddenly, the truck jumped. It felt like if I just ran over a dog. I look through my left side mirror and saw nothing. I noticed that as he is telling me the story, all of a sudden I see a tear in his eye. After that he said that when he took a closer look you could see tire marks on her dress and blood in her mouth. Not knowing why, he decided not to finish the story. I could see him shaking while he told me about the dead bride. Where Is My Necklace ? As a child I was constantly told stories from various family members of being haunted by a rather playful spirit. Named “Hilda” by my grandmother, this ghost supposedly wreaked havoc for years until my mother and her family moved away from her childhood home. After my divorce, my mother and I moved back into her childhood home with my young son. Everything was peachy for several months. One day my mother revealed that she had seen shadows and that household objects would disappear, only to show up sometime later. I quickly dismissed her claims. One afternoon I was preparing to go to work. I was alone in the locked bathroom and in the process of placing my necklace around my neck when it suddenly slipped from my grasp and hit the floor. Absent mindedly I reached down to the place in which I heard it land only to discover it had vanished. A little confused, I searched the entire bathroom but could not locate the necklace. The necklace had been a gift from my grandfather so I was very upset and dwelled on the incident for weeks. I just could not fathom how a solid object could just vanish right before my eyes. I began to research black holes and magnetic fields, but this explanation did not satisfy me in the least. One day I walked into the bathroom and instantly felt the hairs on my neck prickle and my pulse begin to race. Then I did something I had not done in 20 years – I screamed for my mother. There, on the bathroom floor, was my necklace. These incidents occurred when I started high school 1976 and continued on for several years after. Some of these cases involved my nephews and niece. I am a local girl born and raised here in Hawaii. The house my parents once owned was purchased by my dad in the 1950’s, and they were the first owners. The history of this area (Aliamanu), I was told that it was a graveyard before they built a subdivision. These are known factual events that took place. My nephew Jason, while he was growing up, use to report seeing a boy dressed in white underneath our house when Jason would be playing And my niece, when she graduated from high school, moved in and reported seeing a black figure come up out of the floor at the foot of her bed. He was tall and wearing a Hawaiian Warriors helmet! She ran out of the room and refused to sleep in there. She even brought a priest to have her room blessed! But to no avail, that entity came back! In fact, that particular room used to be mine!! My story in my earlier years was so frightening for me that it’s hard for me to forget it! One early evening I came home, turned on my lamp, shut my bedroom door without locking it (it could only be locked from inside). I went to lay on my bed with my window wide open. I finally dozed off only to awakened by a heavy, heavy breathing, almost like someone was gasping for air. So as I listened I found that it was coming from outside my window. Then I realized my lamp was off, I was in the pitch dark, and began running for the door, only to find that it was locked! I scrambled to get it open and knew in my mind that that I never locked the door and turned the light off!! More I panicked, finally got out and ran to my moms room. The next day my brother whom lives on another island and my other two sisters in Honolulu reported to my mom the next morning that they experienced the same exact thing as me! Which was a heavy breathing which started outside there windows and became increasingly loud! My brother told us it got so loud at his house it woke up the neighbors in his cul de sac. It happened around the same time as my incident . We still don’t know what that was but it sounded bad! Since then my mom passed away in 1995, my oldest sister and brother in 2002 (4 monthes apart), and my dad passed in 2006. Before Dad died he sold the house in Aliamanu and since then it has changed owners twice. Aloha! Thank you for letting me share. I’m a thirteen year old girl, and my family and I had just recently moved into an old house. The house used to be my grandparents house but they moved away into another location so the house was empty for years. This house is connected to another house beside it by a long dark hall at the back of these houses. Before we moved in, my grandfather warned my parents that the both of these houses are occupied by ghosts, but my parents took no notice of it, so we moved in to the oldest house after a month of cleaning and fixing pipes and all that. Me and my sister got a room that has a two big windows. This room is at the back of the house, so if I opened my window, I would directly face the dark, creepy hall. To make it look less scary, my parents placed a light bulb that would automatically light up at night. Personally, the light gave me assurance that nothing was in the creepy hall, but I was soon to be proven wrong. One night, a few weeks after we moved in, I woke up at 3 am, no particular reason why. I remembered my grandfather warnings, which is to never look at the big window if I woke up suddenly in the middle of the night, so I closed my eyes shut and tried to go back to sleep. Minutes passed and I was still awake, so I opened my eyes a tiny bit to look at the window. Never had I regretted my actions as I had that night, because when I peeked, this huge, black figure with long black messy hair was walking in front of my bedroom window! I was screaming inside my head but no voices actually came out of my throat. The figure slowly disappeared within the view of my bedroom window and I woke up my sister, crying with fright. I told my mom and she didn’t believe me, but my dad did, and so did my grandfather. They blocked both windows the next day so I couldn’t see past the window, but sometimes I would still wake up in the middle of the night and have chills down on my back. I’m sure many of people have used a Ouija board and some have had real contact with a spirit. I have personally never believed in them because you are scared and anticipating something to happen, so it’s only natural for someone to push the indicator. Despite my disbelief, I still sit down and use it whenever given an opportunity. I am a freshmen in college and sometimes there is simply nothing to do. So my friends and I decided to make a Ouija board and try to contact the spirits in our dorm. After multiple failed attempts and people admitting to pushing the indicator to spell out profanity to get a laugh, we decided to try one more time. This time we turned off the lights and closed the windows. We asked if anyone was there… no response. We asked again, but this time something changed. A sort of coolness came into the room and gave me chills. It was not the windows because they were closed and it was not from a draft because it was 90 degrees that day. At that moment we heard a crash and jumped up to turn the light on. The plastic desk chair had been knocked over as if someone was sitting in it and had fallen over. It was at this moment that I started to have faith in a Ouija board. I have always believed in ghosts and that if you mess with them, they can mess with you or attach themselves to you. Since our Ouija experience, each of my friends have either had dreams or weird experiences like chills or a sense of sorrow that has come over them for no reason. I had not had anything like this happen to me, yet. One night my boyfriend came up and slept over, in the middle of the night I started to have a bad dream, but it was just me in nothing but a black surrounding. Then, out of nowhere a face came shooting out of the darkness saying “Watch out!” starting from a whisper and grew to a screech. At the moment when this face would have hit mine I woke up and in the corner of my room by the wardrobe saw a figure of a man waving and then it disappeared. Since I had woken up so suddenly I woke up my boyfriend also. When he asked me what was the matter I was too speechless to say anything. A couple of months ago, my friend’s cousin (a single mother) bought a new cell phone. After a long day of work, she came home, placed her phone on the counter, and went watch to TV; her son came to her and asked if he could play with her new phone. She told him not to call anyone or mess with text messages, and he agreed. When she first saw it, she was in disbelief. It was her son sleeping on her bed, but the picture was taken by someone else above him… and it showed the left half of an elderly woman’s face. One night, when I was maybe 10-12, I had trouble falling asleep. My bedroom was the entire top floor of our house with my bed and such being on the left side and storage closets and a play area being on the right. I was lying in bed when I heard a noise from the other side of the room and see a rocking horse begin to rock. It was sitting just outside one of the storage closet doors. It proceeded to rock its way halfway across the room and stopped dead under the ceiling light. At this point I was freaking out and just buried my head under my blankets and never peeked out again until morning. It was all confirmed to not be a dream as the rocking horse was still in the middle of my room when I woke up. Furthermore, I got a stern reprimand from my parents for being up out of bed playing with my toys well past my bedtime. Their bedroom was directly below the storage closet/play area and had heard the creaking of the rocking horse shuffling across the room. My grandfather told me this story about how one time he was sitting in a chair in front of the house, when he heard his wife repeatedly calling him from inside the house. The thing is, my grandmother passed away a few years before that. But he told me that the voice was so pressing that he actually got up to look inside the house, and as soon as he got inside he heard a loud crash behind him and turned around to see that the chair he has been sitting in moments ago had been crushed by the cast iron gutter that fell on it. If he hadn’t come inside the house he would have probably been seriously injured. I don’t know if it’s paranormal or not, but every time I think about it it sends chills down my spine. Finley’s bar and grille, smack dab in the middle of farm land is the last of the mom and pop operations complete with its own entity who has resided there for the 16 years that Debra Finley and husband Mark have owned the place. I felt a heaviness of energy years ago when I stopped in for a delicious lunch and wanted to ask if it was haunted at that time but felt it was inappropriate as the place was full inside and in the garden with customers. Recently on a day off I just popped in Finley’s, introduced myself then asked the owners if they have experienced paranormal activity. They were taken aback and wanted to know who told me. After establishing I wasn’t too crazy, just curious if they could validate my feelings, they both opened up and shared the personal experiences they and their staff have had for the 16 years they have owned the business. This was great news as I am a paranormal investigator and wanted to see if my new friend Tabatha Vega owner of G.R.I.P (Ghost Research Investigations of the Paranormal) and I could possibly bring some of our team in to do an investigation. Though it was a first for Debra and Mark letting investigators in they agreed so we came back on a Saturday night with equipment and did a full investigation. Involved in the investigation was G.R.I.P founder Tabatha Vega and her 14 year old daughter Tyrah, investigator Eileen Verhulst and myself Dana Mierkey. The events that occurred were exciting and quite a thrilling hot spot of activity. From the minute we got there at 9 pm my cell phone turned itself on three times in a 15 minute period, my camera wouldn’t function correctly and at the same time this is occurring a voice on Tabatha’s recorder that she left running when we first stepped in the building is heard to say “I’m right here” . Tabatha calls out in the first half hour of being there “is there anyone here ? Can you please make a noise?” A rustling sound is heard coming from the kitchen followed by a very loud crash as a large pot placed upon hooks on the ceiling came crashing down startling everyone. Tabatha reacted immediately and went to the kitchen and was using her school teacher voice asking it to make a noise again. She conversed saying the crash of the pot didn’t scare but excited her and encouraged the unseen entity to do it again. 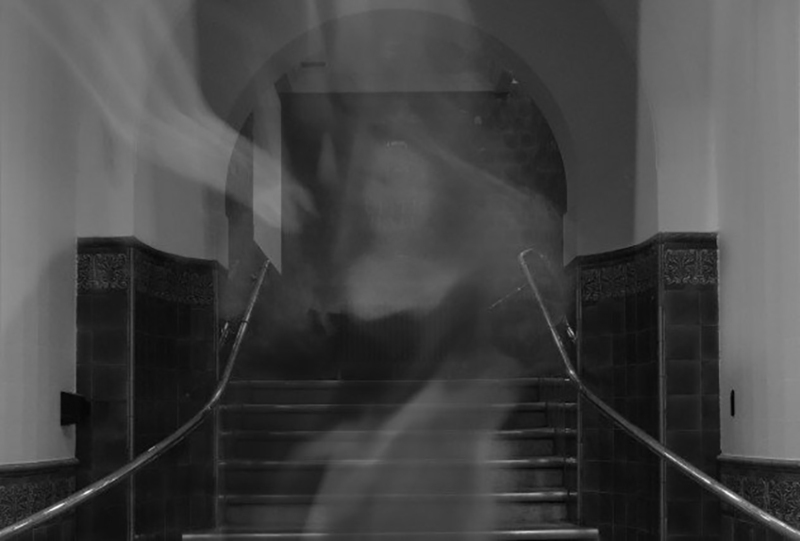 Evp caught on audio, was a whisper that sounded male and said” no.” Tyrah then stepped forward and in her gentle coaxing manner asked the entity to move the spoons, evp caught on audio was another whisper which says “I can’t” . We had a rewarding investigation and obtained some good evidence.